The C. lanceolatum is a species which was thought to be extinct for more than over 50 years. Originated in Guatemala, Mexico and Honduras. The Guatemala Expedition of the scientist Paul C. Standley from 1938 to 1939 provides the most comprehensive description of C. lanceolatum and the habitats where plants of the species were found. 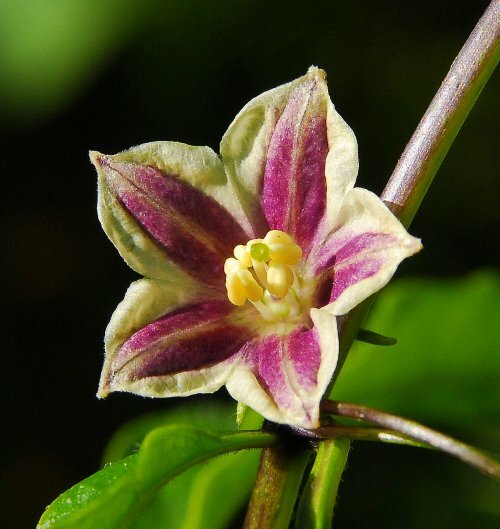 The plant was very close to extinction (It actually was thought to be extinct) until the rediscovery of this species in 1991 more then 50 years later under the lead of Paul W. Bosland who organized another expedition to Guatemala. All of Standley described habitats were visited. A resettlement of C. lanceolatum could, after an investigation of the locations, not be established. Dr . Paul W. Bosland - the re-founder of the C. lanceolatum species. However, there was a new and, unknown location discovered. In the 1133-hectare Biotopo El Quetzal, a biotope protection for the quetzal bird (Pharomachrus mocinno) plants where discovered, and where classified as C. lanceolatum. The species has its original distribution area in Guatemala and in neighbouring countries, Mexico and Honduras. Recently, only a single natural occurrence of the species is known, all other previous known occurrences have been destroyed by the transformation of land in agricultural land. The location of C. lanceolatum is the cloud forests of Guatemala at an altitude from 1200 to 1800 meters indicates that the environment is humid and hazy. Within the group with 13 pairs of chromosomes C. lanceolatum belongs to the species with the most northern distribution area, while the other species are mainly in the south-east of Brazil. 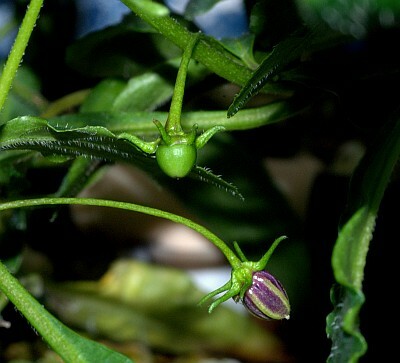 Like nearly all representatives of the genus, Capsicum lanceolatum is also a growing bushy plant with round, pending pods, typical for Capsicums with 26 chromosomes. 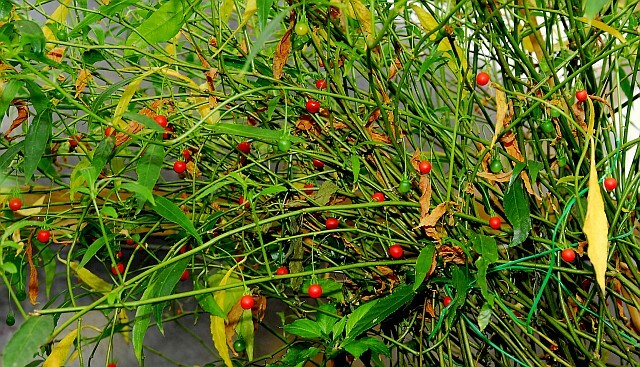 Plant can reach a height from 1 to 5 m. Capsicum lanceolatum differs from all other species of the genus primarily by the combination of leaf shape and position. 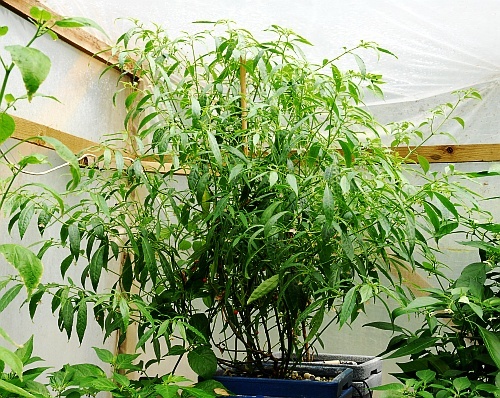 Bushy C. lanceolatum in the Greenhouse. 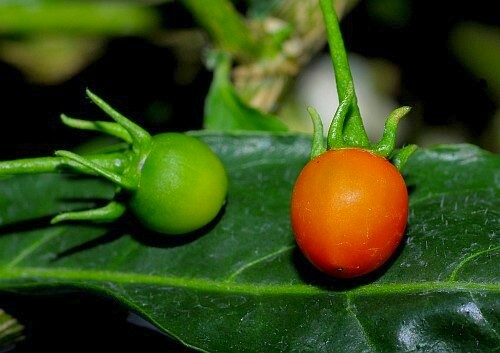 The leaves grow mostly in pairs and both leaves are growing roughly in the same direction, but have very different sizes and shapes depending on the maturity of the plant. The mature plant has large, elongated leaves with a length from 6 to 11 cm and a width of 1.5 to 3 cm. 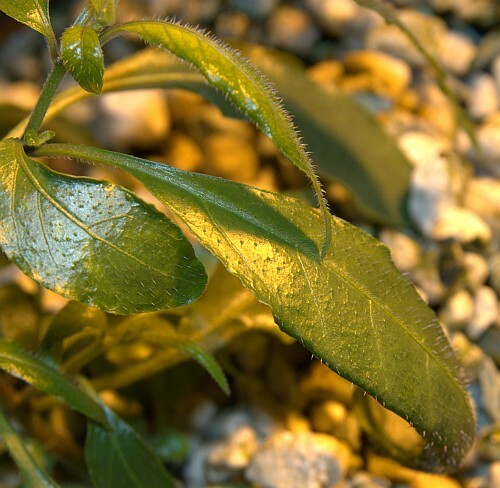 Young plants have some nearly round leaves with a size of 0.5 to 2 × 0.8 to 1.5 cm. Both leaf types are a bit hairy. Young seedling with more round leaves. 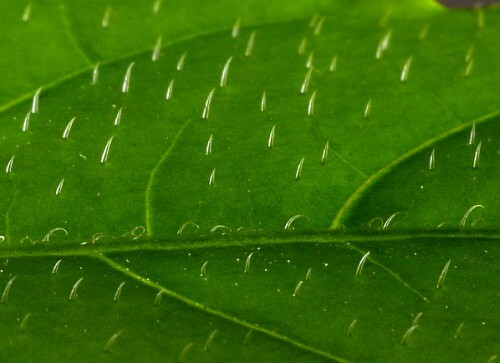 A close-up of the leaf to show the hairiness, or "spikes". The flowering period extends from May to december. 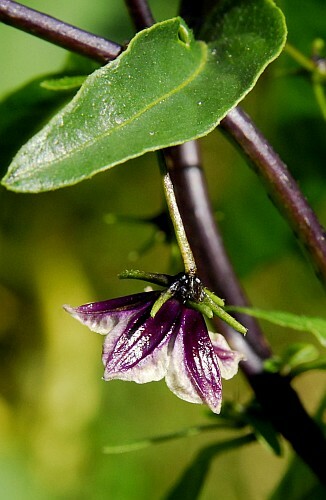 The flowers grow individually and rare in pairs in the internodes on 1.5 to 3 cm long, slender stem, witch extend 3 to 5 cm until the fruits are ripened. The strongly ribbed chalice is 1 to 2 mm long during the bloom and barely will extend. 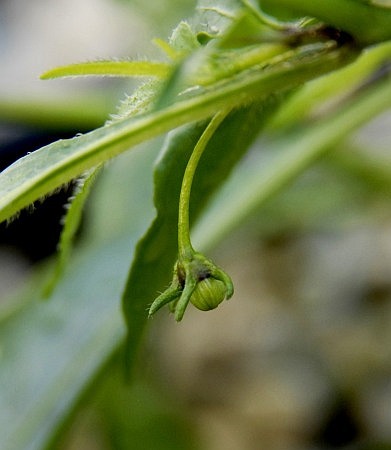 On the edge of the calyx are 2 to 5 mm long calyx teeth, which will extend during fruit ripening up to 4-5 mm. Flower are yellowish-white or two colours white and red-violet, at the peak a bit hairy. 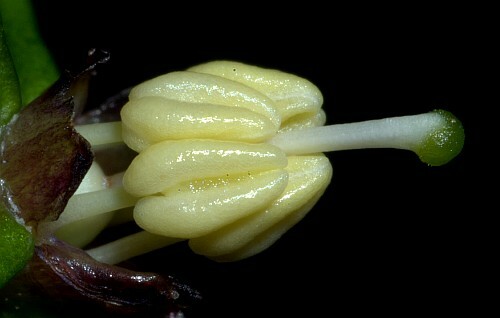 The filaments are about 2.5 mm long, the anthers have a length of 1 to 1.5 mm. The stylus is 4.5 to 5 mm long. Front view off the C. lanceolatum flower. 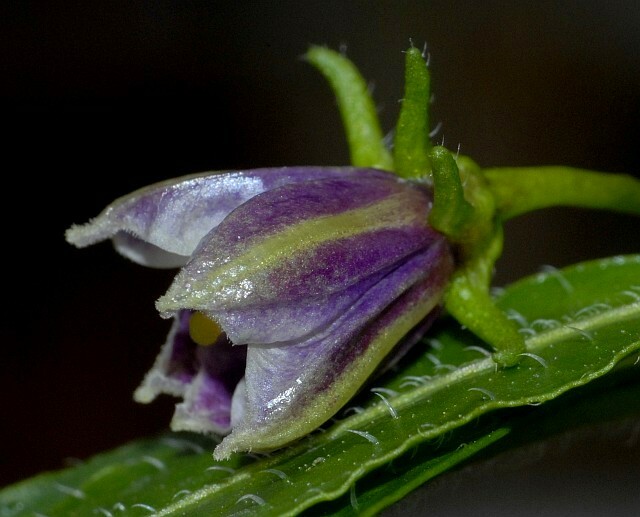 Side view of C. lanceolatum flower. Note the hairiness of the leaf. Pistil and immature stamens -closeup. 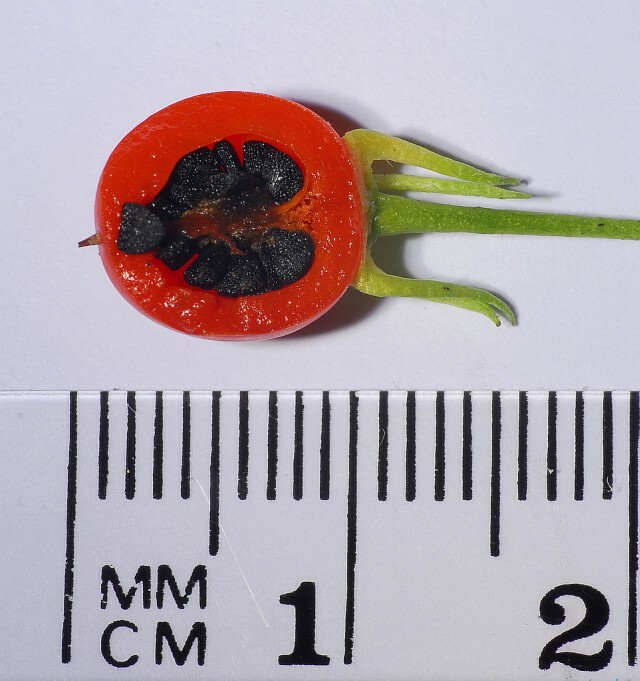 As for most wild species of the genus the fruits have a diameter from 7 to 10 mm very small, round berries, witch are orange-red, stuffed with flesh and not sharp. 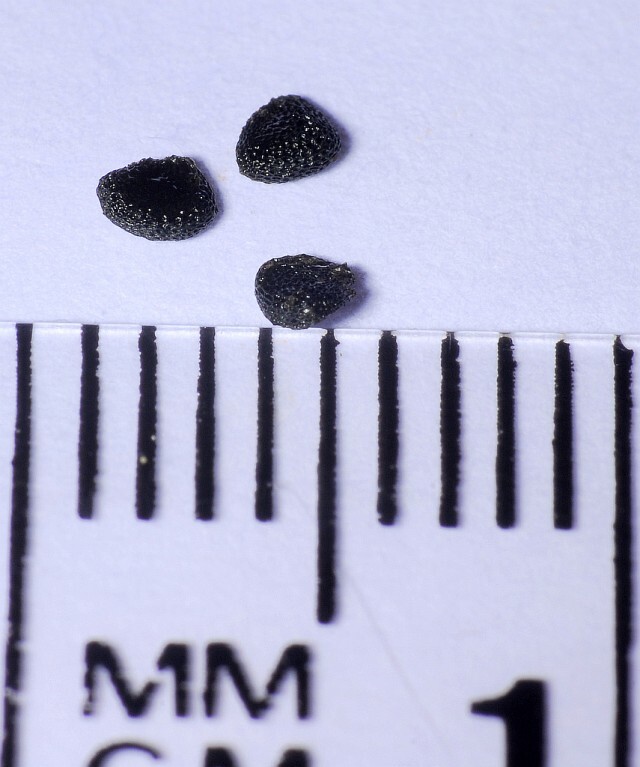 The seeds are black, and 2 to 2.5 mm. 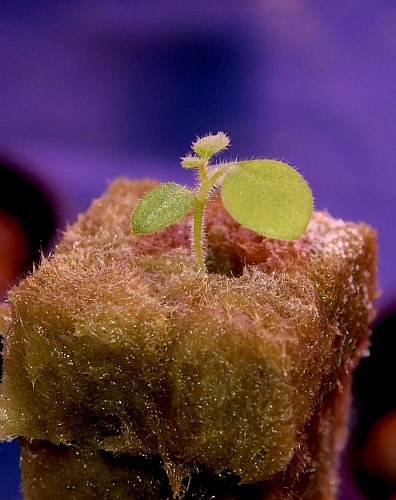 The plant is self-compatible. C. lanceolatum, like some other, Brazilian wild species has 13 pairs of chromosomes. Typical features of the species with a number of these chromosomes are the preference for moist environments and usually yellowish-green, non-sharp, small fruits. 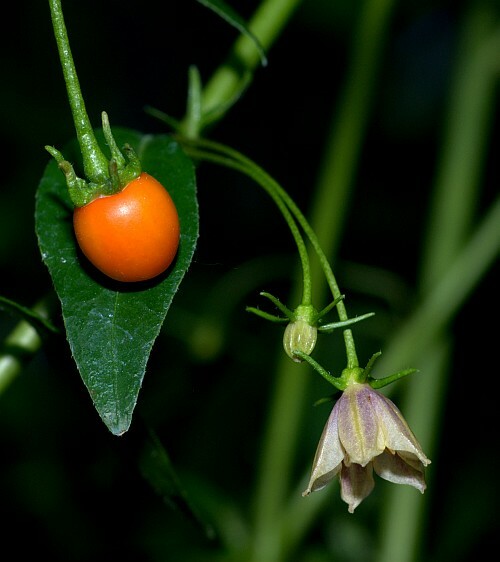 The orange-red fruit C. lanceolatum differs from other related species. The scientific name of Art (lanceolatum) is derived from the leaf form (lance shape). The indigenous Mayan word for the plant is „IC" spoken with a distinctive clicking word. Usually names like „Yerba de pajarito" (Little Bird cabbage) or „Pajarito del rio" (Little Bird of the river) are used. 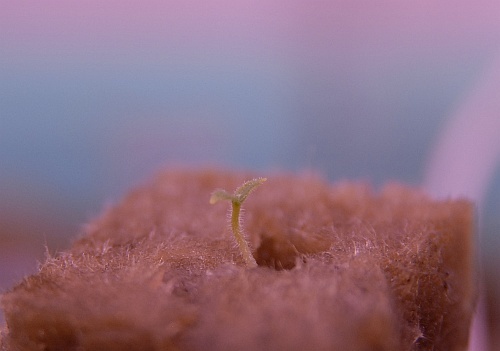 Tiny C. lanceolatum -just germinated! C. lanceolatum growing a few pairs of true leaves. 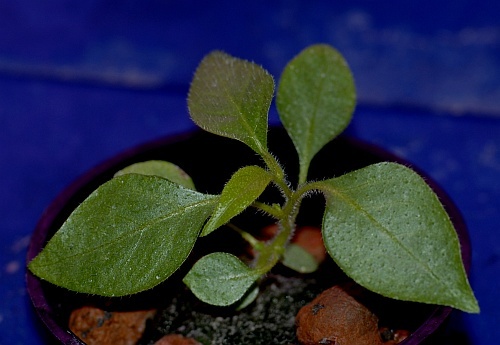 Leaves of a little larger seedling. Note the hairiness. Flowerbud and immature pod forming. Top view of the flower. The color becomes very strong under a direct sunshine. 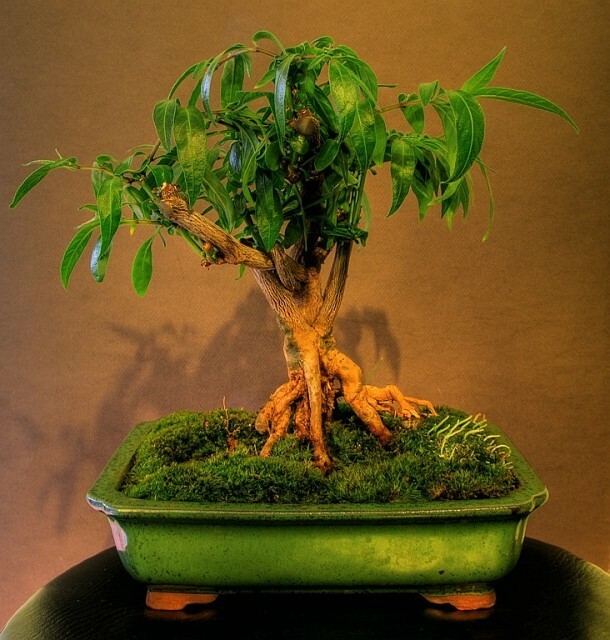 C. lanceolatum "Bonchi" (Bonsai Chile). and ability to grow thick, woody stems in a very short time. 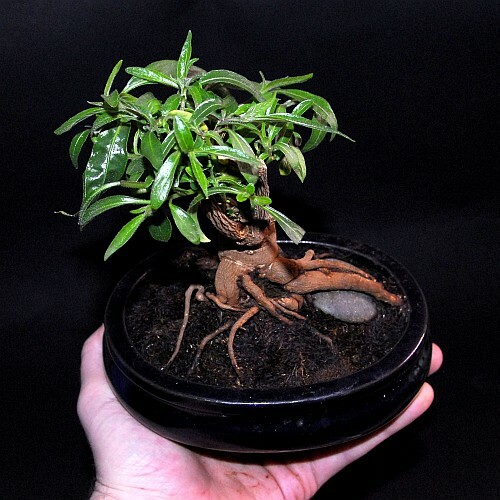 Another C. lanceolatum Bonchi individual. Pictures: fatalii.net except where other indicated.